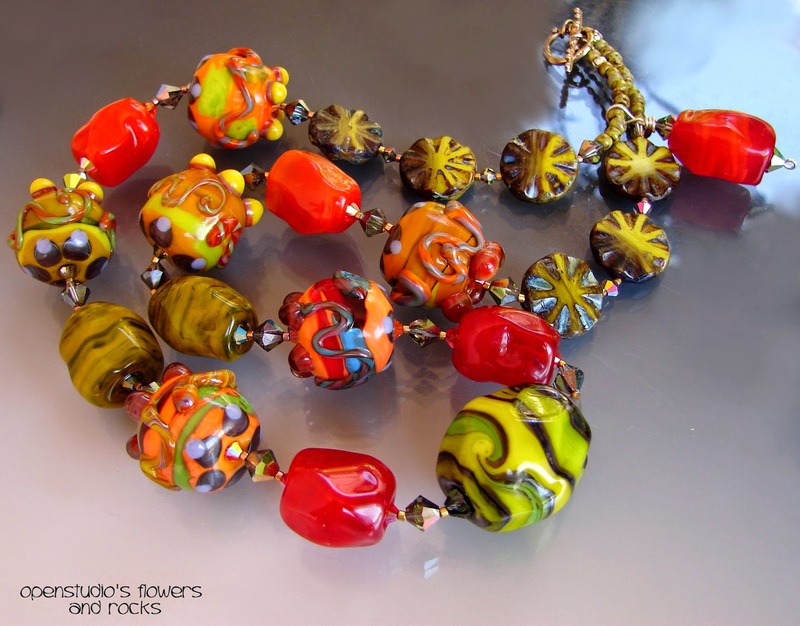 Laura Blanck: The Great Bead Soup Blog Party has arrived!!! 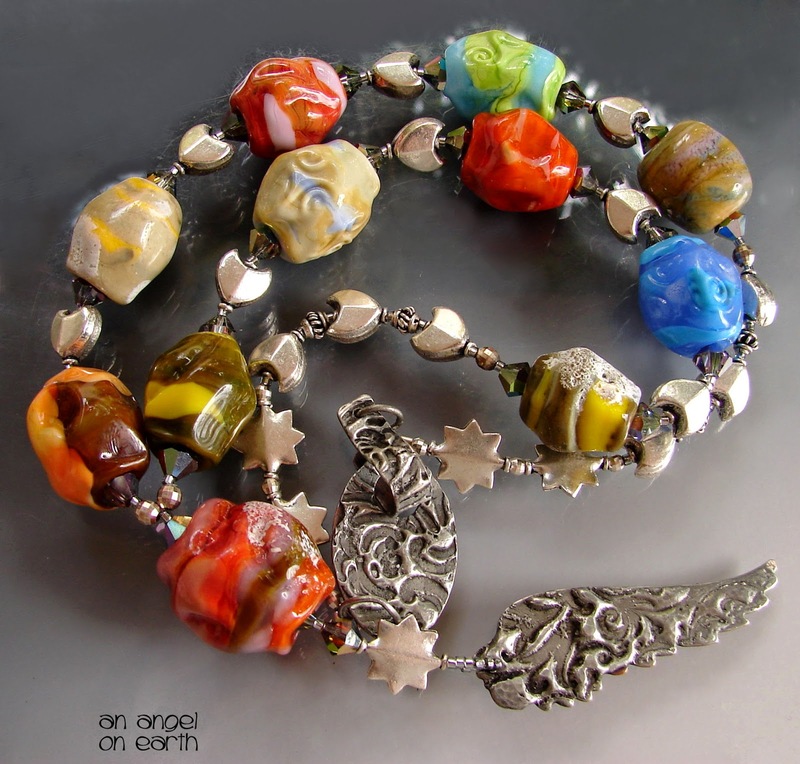 The Great Bead Soup Blog Party has arrived!!! "AN ANGEL ON EARTH": In this first necklace I've featured her handmade Sterling Silver Focal Wing and her handmade Silver solder Clasp. I've combined them with Sterling Silver beads that look like wings and stars, Swarovski Crystals, Japanese seed beads and my own glass handmade lampwork rock beads. The title says it all, the ethereal presence of angels among earthy rocks. An angel wing will always protect us. "SING AND DANCE": I've made this necklace featuring the enameled pendant I received were my partner in this party recreated a phrase about art by Twyla Sharp (dancer and choreographer). I also got two enameled round beads with the words "Sing" and "Dance". I've completed this piece with Japanese seed glass beads, Swaroski Crystals and a clasp made with a glass Czech button. "SHINER BOCK": This third necklace shows all the colorful complementary beads that were in the soup I've received, including a rare focal bead that I've placed on one of the sides. I've added some Crystals and Japanese seed glass beads. I've made a twisted braid that hangs asymmetrically for a funky look, either to the back or the front. The clasp is an element I've found in the Scrap Books section of a craft store. 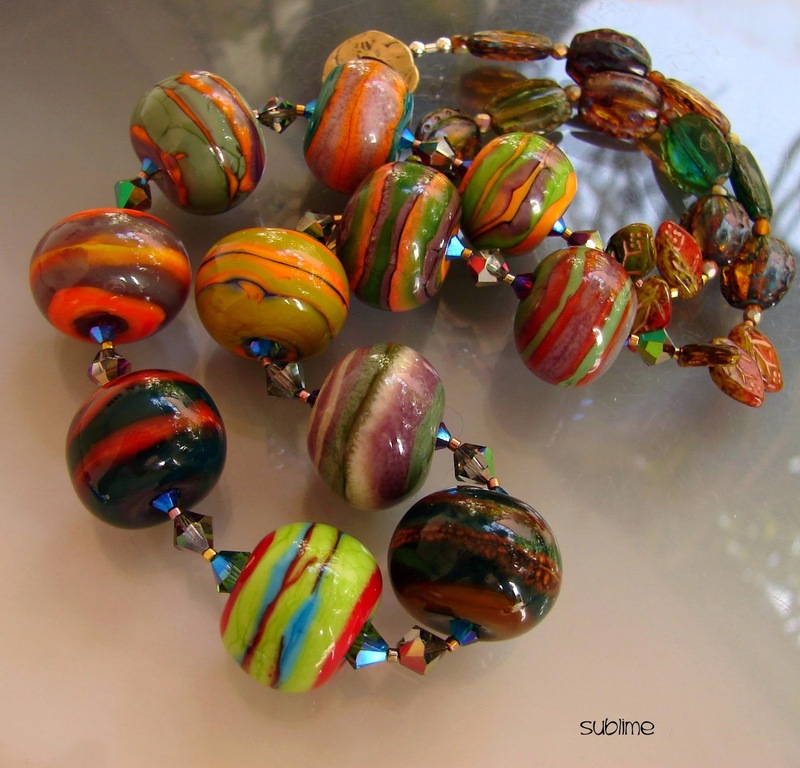 I was so in love with the glass beads I've sent my partner for this event, that I kept melting glass and created two more necklaces with similar style beads: Ruedas (striped, with lines), Rocks and Flowers. 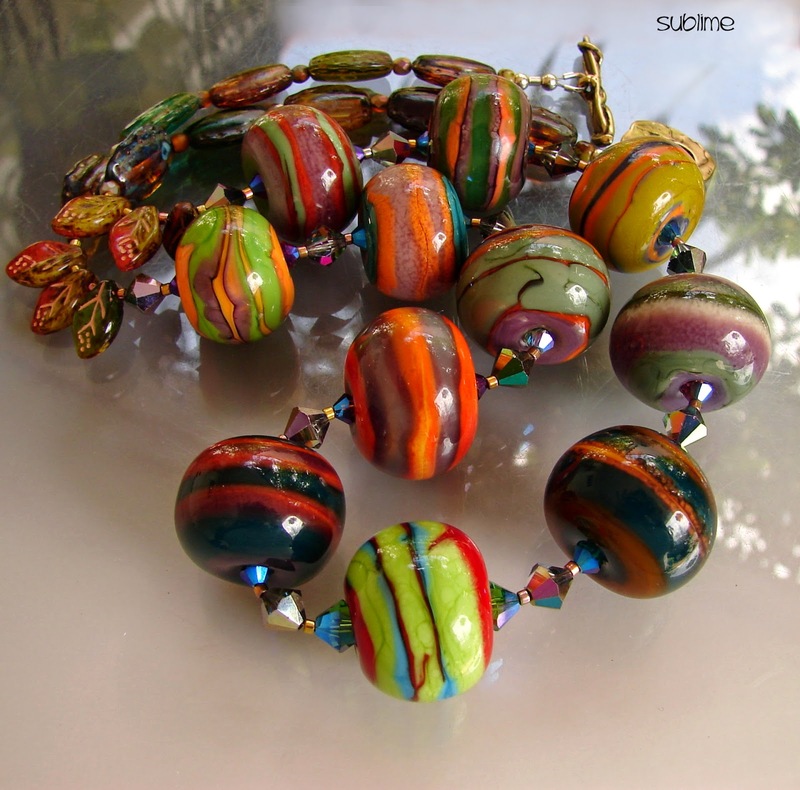 I've created these two following necklaces with my own handmade glass beads: "SUBLIME" and "OPENSTUDIO'S FLOWERS AND ROCKS". I'm so happy making glass beads! I've completed these necklaces with Swarovski Crystals, Czech glass beads and handmade bronze clasps by Cathy Dailey. Please keep scrolling down the page to see the original packages that were sent, I've posted the photos in my previous update. Have fun in this Bead Soup Blog Party. Thank you for visiting my Blog, Laura Blanck from Openstudio/Openstudiobeads. That first piece is absolutely perfect - the colours just make my heart sing! Your rock beads are gorgeous. Fabulous pieces. You did wonderful things with your soup. Love the colorful pieces you made - especially the green one! Great Job! All beautiful pieces but the Sing and Dance necklace is so stunning! Nicely done! one yumm after the other! but that shiner bock necklace to me really is the show stopper! what a gorgeous splash of color! love it! Such vibrant an joyful colors!!! My absolute favorite is the first necklace, but all the others are very pretty, too! Your beads were the PERFECT foil for the clasp. 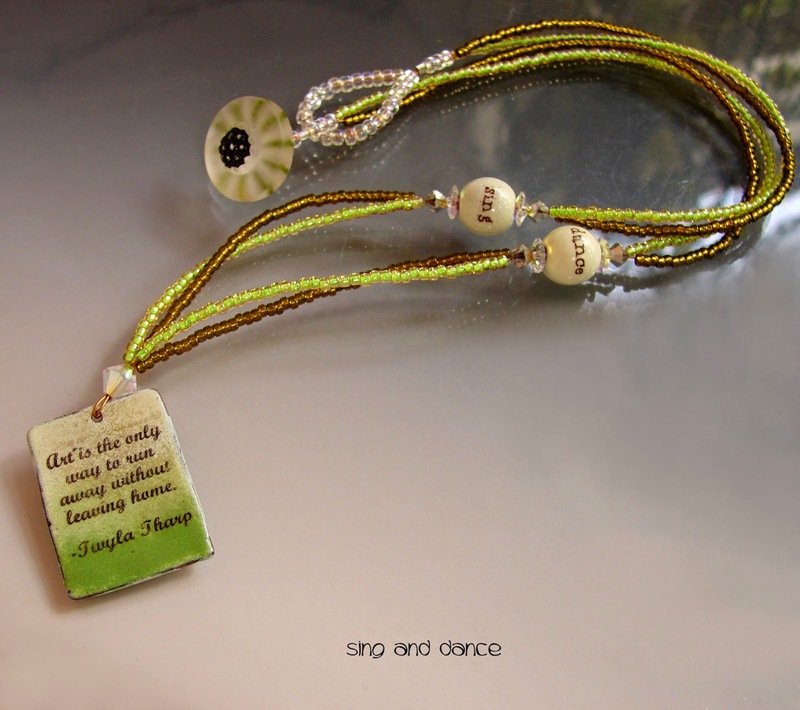 I also quite like the green necklace with the Twyla Tharp quotation (I wish I'd been a dancer). 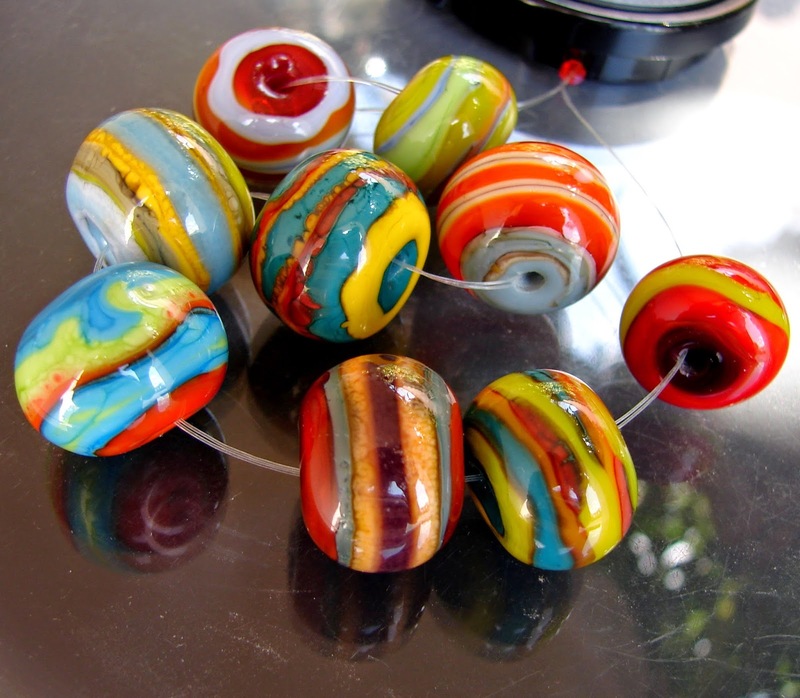 Your work is so beautiful, and I would have been so happy to receive your lampwork beads to play with. I need to get some! These are all so wonderful, each in its own way, Laura :) You obviously enjoyed matching what you received with your own artisan beads, and the pairing is magical! Everything, everything I say, is gorgeous. Such beautiful colors and those silver wings and clasp are beautiful with your beads. Shiner...is gorgeous too. Just love it all. Great job. Jasper necklace-absolutely amazing, elegat and superb! Hi Laura! OMGosh I canNOT pick a favorite! 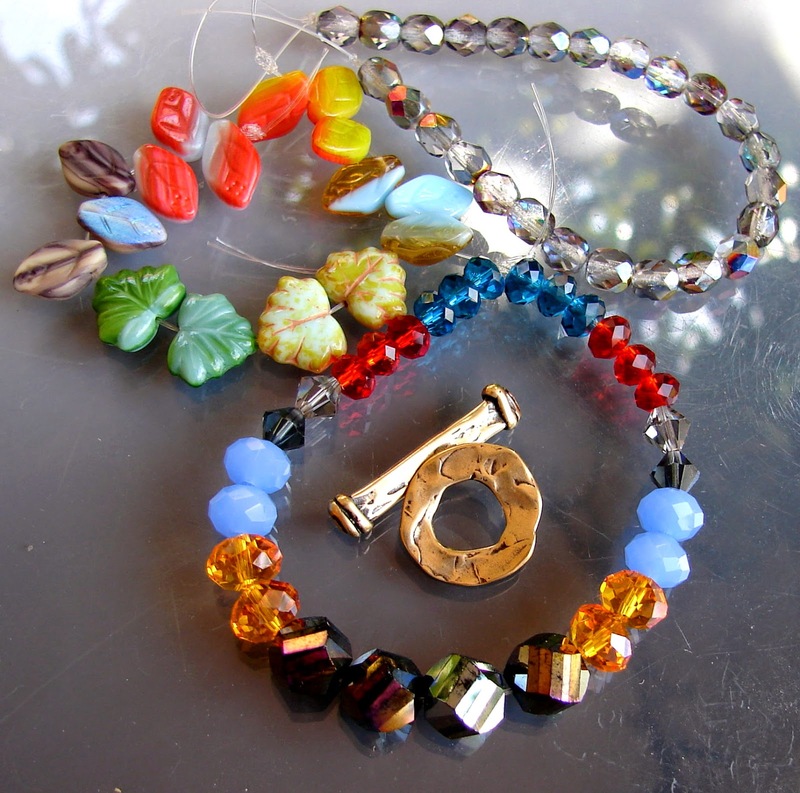 All the colors are amazing together, love the ribbons, and the stamped solder charms too! 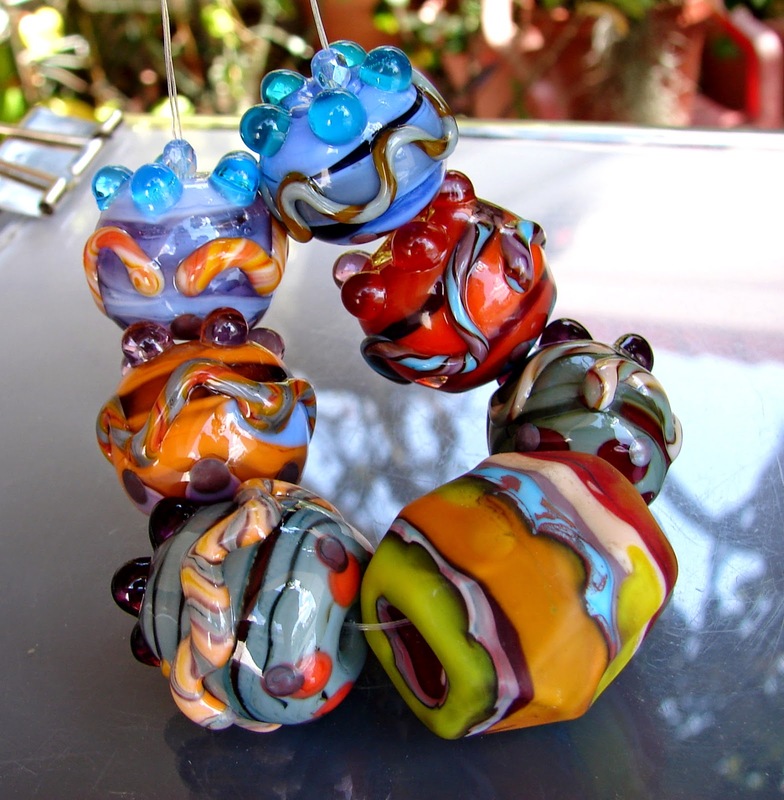 oooh - I love big chunky colorful beads and you know just how to put them together!! Beautiful! You created some marvelously happy beads to use with your soup and the joy they added to your pieces is wonderful. Love it all! Great soup! what BEAUTIFUL pieces! i'm completely in love with each piece you've made. 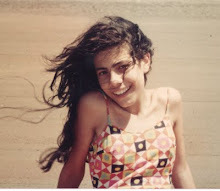 so bright, cheerful, fun and playful. Your beads are full of colors and joy, Laura! Loevely soup! Such incredible use of color in every piece! Your glass beads are exquisite and so very eye-catching. Great use of your soup too. 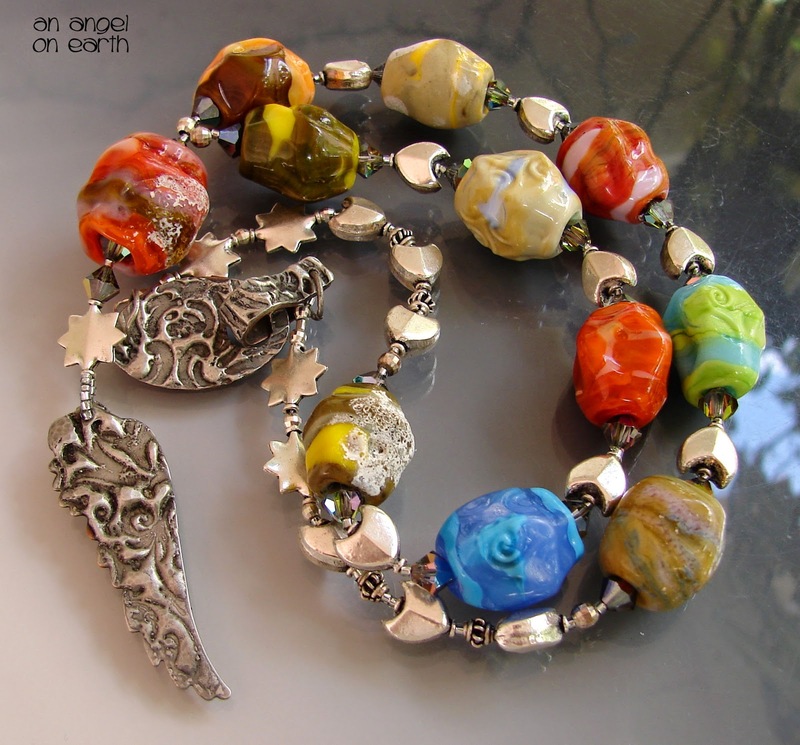 I like how all your creations are so different but I couldn't resist the bohemian spirit of the last necklace with the assortment of colors and shapes and mixed media! Oh my, such beautiful pieces, the designs and color combinations are wonderful. Great use of your soup! You had quite the eclectic soup to work with! Your own lamp work beads really combined well with the other pieces. All of the designs are lovely. My favorite is the first one, with the angel wings. 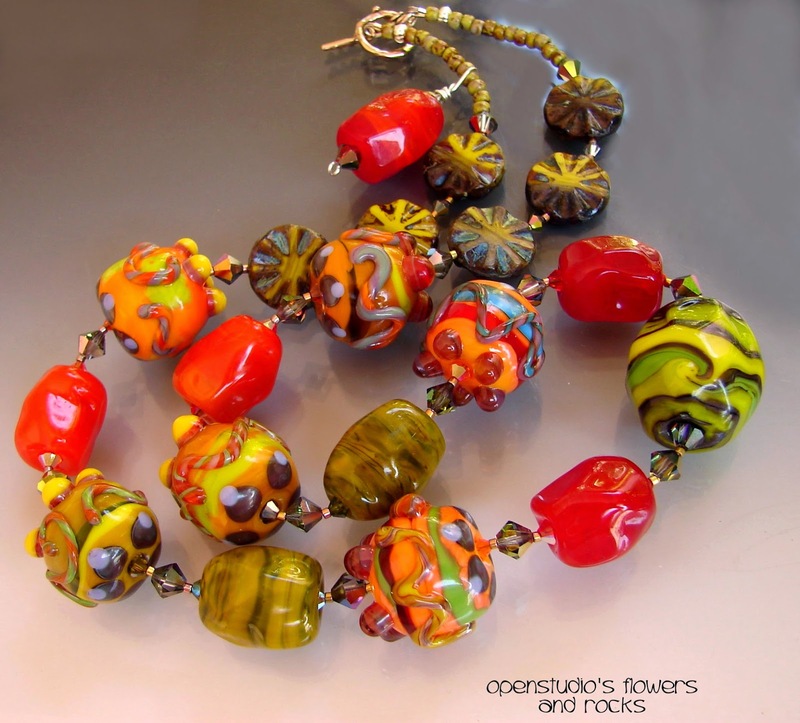 Laura, you've made some beautiful necklaces both with the bead soup and with your own beads! I especially like the colors of the one entitled "flowers and rocks". 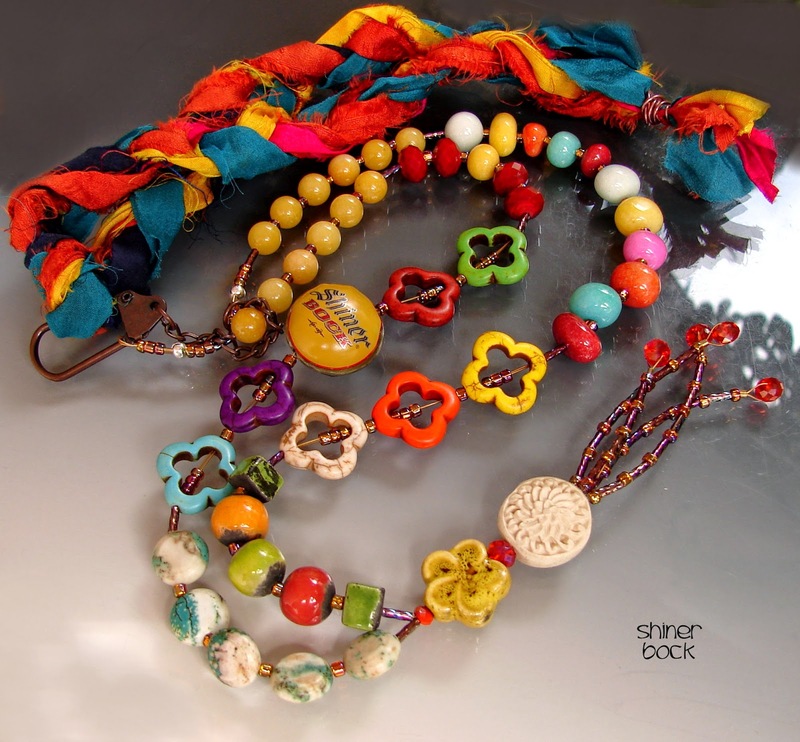 Love all the color, especially in the Shiner Bock piece and in your yummy beads!